I have a problem to report with NU. From the main window if you click on Manage Your Startup you are supposed to be able to right click on any entry and remove that entry from the list. This does not work. If I RMC and select Remove Selected Item it does NOT work. The item remains in the list. You get the option to remove the item from the list, but do you visually see anything happen? I'm assuming you're on the latest build, but could you verify the full version of NU? Thanks for the response. Yes I am on the latest, 14.5.0.118. This has been there from day one with NU, it is not new to this version - I just finally got around to posting about it. That's just it, its not just that it does not get saved. Nothing visual happens either. You click remove and it simply stays put (e.g., stays in the list). FYI: When I first ran into this as you might imagine I done quite a bit of troubleshooting up to and including the use of NRT, etc. Probably not surprising that I done all this since I help out on the forums so much. Left click on the item you want to remove so it becomes highlighted. Right click and choose "Remove selected Item." You should receive a prompt and then it should not longer be present. That is exactly what I do but it does not work. There are a couple of items that show up more than once in the list for some reason. I wonder if that could have something to do with it. Let me do some digging for you Allen. Could you list what items you're trying to remove? One of the developers is thinking it may be permissions causing your issue. Thanks. Being a software engineer I can assure you I have full Admin rights across the board but I was thinking perhaps there might have been some subtle registry corruption but I checked that out as well and that is not the problem. Some time back I am pretty sure I had problems using NU removing entries in the Run and RunOnce section of the All Users section but now I see those are working. I basically exported the registry keys so I could get them back easily and removed them with NU and it was successful. So I then imported them back into the registry and restored the ones I deleted from NU as a test. Where I currently see the problem and what prompted me to finally start this thread was that I cannot remove ones in the Common Startup Folder section of All Users. But I can remove SOME in this same section so that got me to looking closer. What I found is that there are a couple of entries which are duplicated more than once in this list (pointing to the same target). If you look at the image I attached you will see for example that there are 5 entries which have HP under the Product name. And if you look closer you will see some that are clearly bogus. For example you will see one entry for the old Norton System Doctor which is still there despite the fact that I have long since removed NSW and since I have used the NRT at least twice. 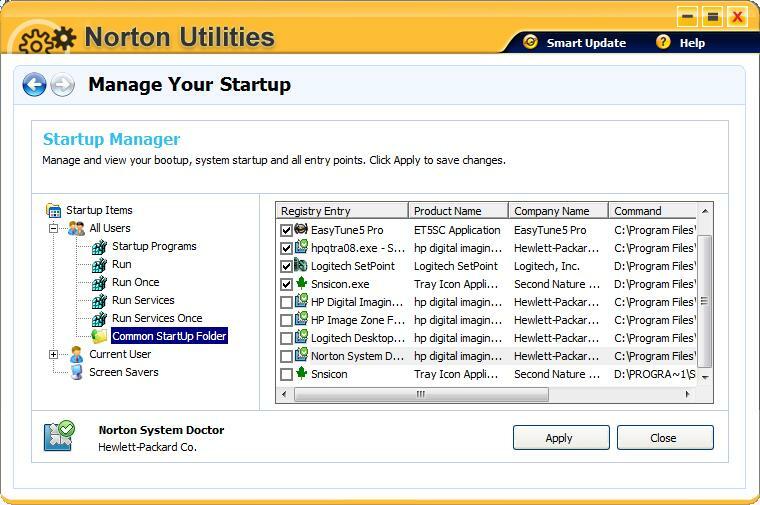 Yet this Norton System Doctor has HP under product name which is clearly NOT correct. Further all 5 of the entries point to the exact same target! You can't see this because it if off the right edge of the screen and unfortunately NU does not allow you to resize the window so I can't make it all visible. But trust me, they all point to the same target. Further there is a double entry for snsicon which is valid by why two of them? The ones in the list with a checkmark on them can be deleted but NOT the ones without a checkmark even though they do in fact at least point to valid targets. Another kicker is that when I bring up msconfig, NO such anomalies exist so it begs the question - where is NU getting these extra entries from? E.g., msconfig shows no bogus entries and no double entries in the Startup tab. Please let me know if you need further explanation on this. I know its a lot to absorb. I'll send this info to the team. Just waiting for some more information. This seemed to have done the trick. The bogus items are now gone. There was only one extra item in this registry section which was the one that referred to Norton System Doctor. Removing just that one removed ALL the ghost entries as shown in NU. Any idea why this one bad entry could cause multiple items to appear in NU like that? And why NU could not remove those ghost entries? For me, no clue. My suspicion would be a bad registry value that contained identifiers that were translated as multiple entries. Thanks Erik, main thing is it is done now.